The future design direction of new SEAT models has been unveiled tonight as the wraps have come off the all-new Tarraco. 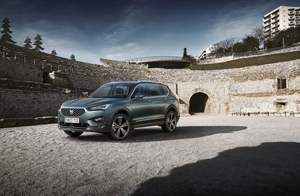 The large SUV – named after the Mediterranean city of Tarragona, a historic cultural centre with a spirit that is young and adventurous – completes the Barcelona-based manufacturer’s SUV range. The latest vehicle designed and developed at the facilities of SEAT in Martorell (Barcelona) and produced in Wolfsburg (Germany), marks the third instalment in the company’s SUV product offensive and shows a glimpse of the future design language of new SEAT models. Tarraco is the new flagship model of the brand and will bring the company new customers, boost brand image and have an important effect on profits, as this is a model with high contribution margins. Tarraco sits at the top of SEAT’s SUV family, as the bigger brother to both the Ateca and Arona, and mixes state-of-the-art technology, dynamic and agile handling, practicality and functionality with elegant, progressive design. The Tarraco combines the many advantages of its larger dimensions to offer a vehicle that can take on all elements of modern life. The new SUV blends the key attributes of every vehicle in the SEAT range – design and functionality, sportiness and comfort, accessibility and quality, technology and emotion –but in a form that suits a wider variety of lifestyles. The new Tarraco is designed for drivers who need the usefulness of a five or seven-seater and the practicality of a higher driving position, but are conscious of a vehicle’s aesthetics and appreciate the Tarraco’s balance between self-confidence and elegance. That balance is maintained across both available trim levels, SE and Xcellence. Two petrol variants will be available: a four-cylinder 1.5 litre TSI unit that produces 150PS and is linked to a six-speed manual transmission powering the front wheels, and a 2.0 litre, 190PS offering mated to a seven-speed DSG gearbox and 4Drive total traction system. There are two diesel options, both 2.0 litre TDIs, with power outputs of 150PS and 190PS respectively. The 150PS variant can be connected to either a front-wheel drive, six-speed manual or seven-speed DSG with 4Drive system. The higher powered version is solely available in 4Drive/seven-speed DSG gearbox. Later, the SEAT Tarraco will also benefit from alternative powertrain technologies. “The SEAT Tarraco is a masterpiece of functionality and flexibility, as it offers the space and flexibility customers expect from a large SUV. It is the sportiest vehicle in the segment from a design point of view and also thanks to the dynamic chassis control, which allows you to tune it to meet your driving needs,”said SEAT Executive Vice-President for Research and Development, Dr. Matthias Rabe. The new SEAT Tarraco has all the driving assistance systems needed to make driving more comfortable and secure, even in more demanding driving environments. Well known systems such as Lane Assist and Front Assist including bicycle and pedestrian detection are standard in Europe, while systems such as Blind Spot Detection, Traffic Sign Recognition, Traffic Jam Assist, ACC (Adaptive Cruise Control), Light Assist and Emergency Assist are available as options. Taking safety to the next level for SEAT, the Tarraco SUV also includes Emergency Call, Pre-crash Assist and Rollover Detection, meaning no matter what the situation, the vehicle is designed to meet the most demanding safety standards in order to make the large SUV the benchmark model in the segment. Bigger dimensions inspired the design team to find a greater balance between aesthetic integrity and purposeful proportions. And even though the Tarraco SUV is 4,735mm long and 1,658mm tall, creating a huge interior space and an imposing exterior, the overall design implies a lightness and agility as well as a robustness and perception of space. And as our world becomes increasingly digitised the Tarraco’s interior benefits from SEAT’s 10.25’’ Digital Cockpit, streamlining the delivery of important information to the driver, and an 8’’ large, floating HMI screen where occupants can access SEAT’s suite of connectivity options. Finally, when it comes to infotainment systems, The Tarraco will be the first SEAT to feature gesture control functions (when equipped with 8’’ Navigation Plus). Do you mind me asking how much the DSG oil/filter change was at your indy? How do I do that? Do I go to the navigation module? Re: Have your alloy wheels defected? You might have taken the wind out of my sails there! Thanks - now its rattling and not just whistling though i think it must be some metal broken. I tried forced regen on VCDS before I saw your message, but it aborted due to safety reasons.